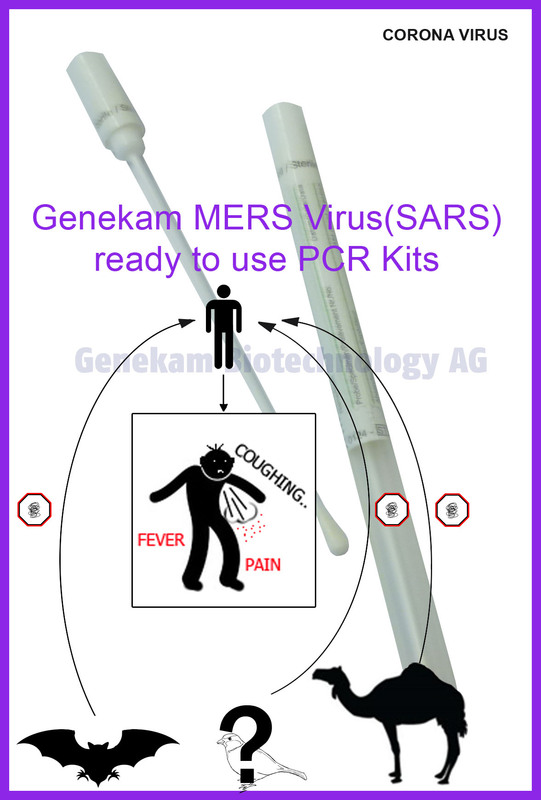 Genekam has developed a number of ready to use PCR kits to detect different kinds of corona viruses including SARS virus. The outbreaks of the Middle East SARS virus in Qatar, Saudi Arabia, UAE, Egypt etc need an urgent attention to find out the mode of transmission, source of transmission and other scientific issues. It is well known fact that bats are natural carriers of corona viruses particularly SARS virus caused fatal disease in many countries around the world in human beings. Not only this, one should test avian species and other wild life also for the presence of SARS viruses, therefore first method of the choice is to seek the answer whether a particularly organism carries at all a corona viruses. If it is positive and the next question will be which corona virus it carries. Such question regarding the kind of virus can be answered through ready to use PCR kits of Genekam Biotechnology AG. A. Ready to use conventional PCR kits (gel agarose): These kits contain all components to conduct the PCR test except RNA isolation kit. The RNA Isolation kit can be used from us or other source. The results can be seen as band in gel agarose. 1. Fluhunter-Corona (Universal kit) with 5 or 25 genesequencings: This kit is in position to let you know whether the sample has any kind of corona viruses including human SARS viruses. This is solution particularly good to detect the unknown corona viruses (including SARS) in unknown sample. Once you have a band, you should do genesequencing to know the exact strain of corona virus. This kit detects corona viruses of mammals and avian origin like human, bat, cows, cats, dogs, poultry, wild life etc. This kit can be used on camels also. To conduct the genesequencing, one can send Genekam PCR product for genesequencing. With help of genesequence, one can detect the exact type of corona virus in sample. 2. Fluhunter-Corona Plus (Universal kit) with 5 genesequencing: This kit contains solutions for detection of corona virus (including human SARS virus) as mentioned in point 1 and Middle East Sars virus along with genesequencings. We have added the solution that you can do genesequencing in anywhere in world. If you have your own genesquencer, you can do it in your own laboratory. 3. Fluhunter-Corona Extra (Universal Kit): This is another solution for detecting unknown corona-viruses (including Human SARS Virus) and middle east human SARS virus in samples. This kit comes too with genesequencing. It is highly recommended to use two different kits for detecting the corona viruses as it increases the chances to detect unknown corona viruses circulating in the particular area. 4. Fluhunter-ME-SARS-Single Check: To detect middle east SARS virus with single check. 5. Fluhunter-ME-SARS-Double Check: To detect middle east SARS virus in samples with double check as it will make the assays more sensitive and results can be more reliable. The results can be seen as band in gel. Further the results can be reconfirmed with genesequencing. This is way the reference laboratories work. 7. Mammal Internal Control: To confirm whether you have isolated RNA from the samples of mammals like bats, cow, camel, cat etc, one can run the internal control. Middle East SARS-Virus is the strain which has outbroken in different Middle East countries recently One of biggest application for our kits is that one can do fastnresearch work e.g. one can write Master or Ph.D. It is not only thesis, but one can do the other research work as well as monitoring together. Genekam kits are answer for many Govt around the world to take such kits and go for work rather wasting time and resources to develop an assay. To prevent a disease, the time is one of the key factor. Therefore one can use Genekam ready to use PCR kits to accelerate this process.